As much as I like authentic Asian food, sometimes you need something quick and decent on your lunch hour. I was presented with this problem recently when running out to buy some office supplies at the local Staples in East Hanover, and lo and behold, I saw a newish quick-serve restaurant that I hadn’t seen before, Wild Noodles. Wild Noodles is a chain that originated out of Arizona but has now spread to 9 different states. Essentially, the concept is a la minute prepared wok noodle dishes (Including Asian, Italian, and “American” noodle selections) salads and rice bowls, using fresh produce, served in a clean and modern atmosphere. You walk up to the counter, order your meal, and then a line chef cooks up your order from freshly chopped up components in a mise-en-place. You take a number assigned to you, walk to a table, and then someone brings your food to you. The dishes they serve are not unlike the kind of quick stir fries and simple pasta dishes you can make in your own kitchen, but of course, you have to go thru the effort yourself to do. In my opinion, this casual quick serve dining option is way better than going to some local Chinese takeout place or some food court Asian restaurant chain that has “lunch specials” with stuff that’s been sitting under heat lamps in chafers for God knows how long. 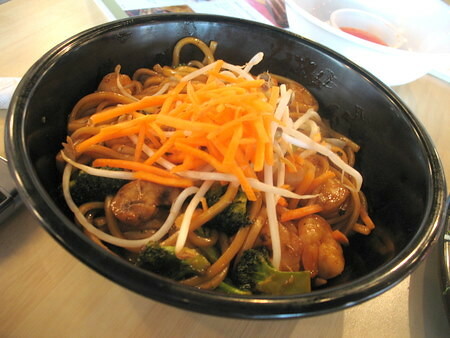 Up until recently Wild Noodles also had stores in both Ridgewood and Westfield. I can imagine the Ridgewood store didn’t do so well because of the horrendous parking situation and stiff competition from other Asian restaurants in a very high-end restaurant kind of town. It’s much better suited for a chain-friendly area (read as, TGI Fridays, Chili’s, Macaroni Grills, etc) with fewer healthier dining alternatives with lots of corporate office parks like Route 10, or like where their newest store that is reportedly coming to on RT 17 in Mahwah. 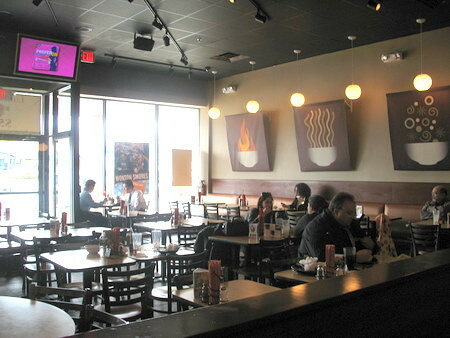 When I worked in the Ramsey/Mahwah area a few years ago, I would have relished a Wild Noodles location. 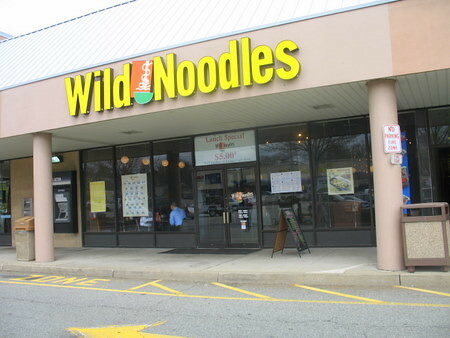 Wild Noodles Castle Ridge Plaza location in East Hanover. The clean and modern dining room. I can’t tell you how many people that I know absolutely refuse to eat at Asian restaurants due to concerns about cleanliness issues — Wild Noodles should be a great alternative for them. Me, I don’t mind a little extra crunchiness from unknown sources, what doesn’t kill me makes me stronger. 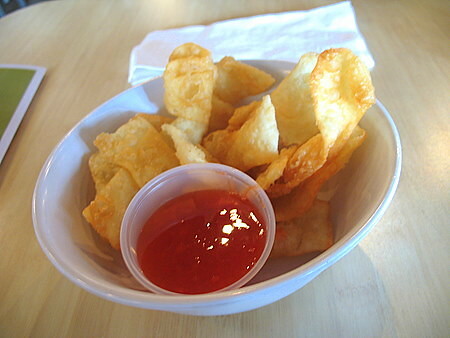 Complimentary (fresh) deep fried wonton skin noodles, with a surprising spicy version of a classic Chinese-Am duck sauce. 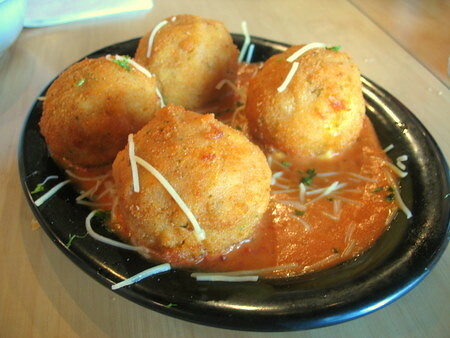 For an appetizer I ordered the fried Mac and Cheese, which is served in the style of an Italian arancini ball with a marinara sauce. They give you four balls, and I was really only able to eat like one and a half — this is easily shared between 3 or 4 people. 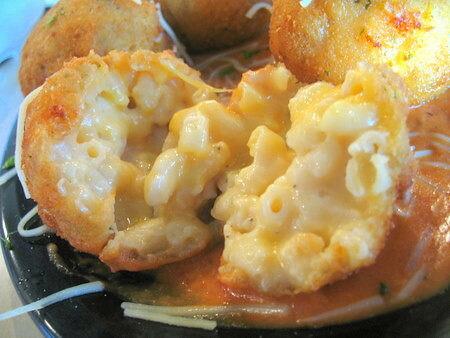 Fried Mac and Cheese closeup. 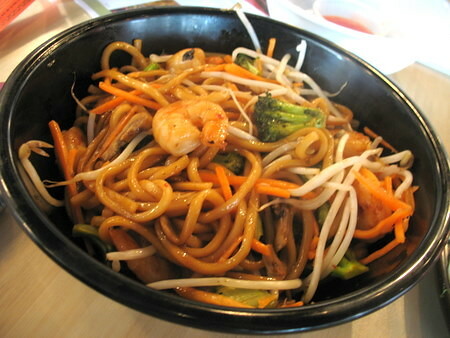 My main dish was the Mongolian Noodles with Shrimp. All the produce was fresh, and the dish had a nice clean taste. It was both sweet and spicy, not entirely unlike a traditional hoisin-based Chinese noodle stir fry. Mongolian Noodles, after I tossed it up a bit for this picture. This entry was posted on Thursday, April 26th, 2007 at 11:39 am and is filed under Food, General, New Jersey. You can follow any responses to this entry through the RSS 2.0 feed. You can leave a response, or trackback from your own site.